I love vintage tablecloths and cobalt blue glass vases. My Grandma always called these colorful print tablecloths, lunch cloths. 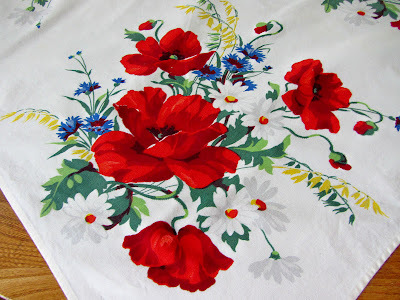 I have quite a few lunch cloths that I picked up for the beautiful designs but I don't use them much. I hate ironing. 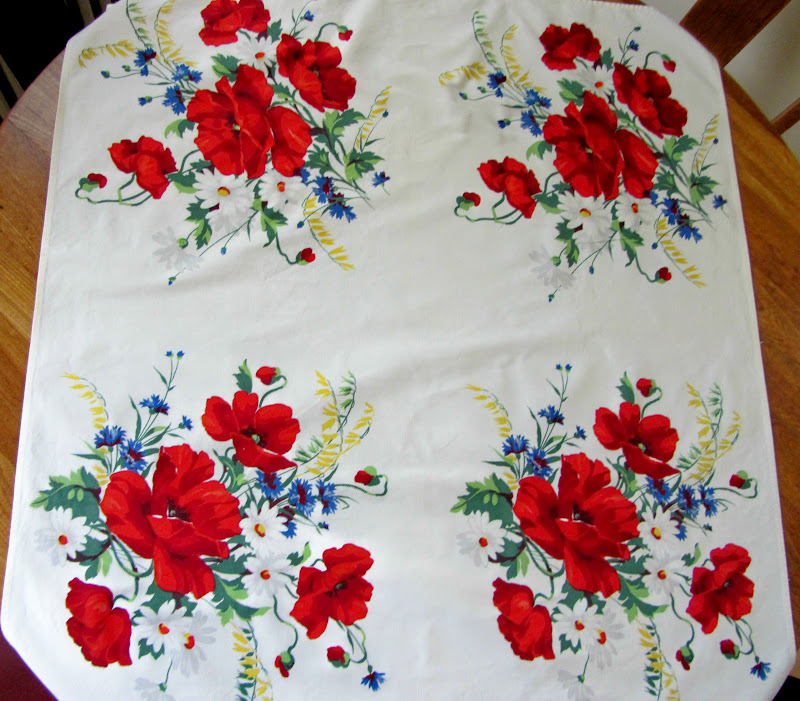 When lunch cloths were in style, women definitely did a lot of ironing. This lunch cloth is a beauty, poppies, daisies and bachelor button or cornflowers. Not sure what the yellow flowers are. I had a little wooden shadow box with a bead board bottom that I just re-painted a creamy white and added handles to the sides. I distressed it a bit. I think it will make a great vignette box. Here my white box full of cobalt blue vases. 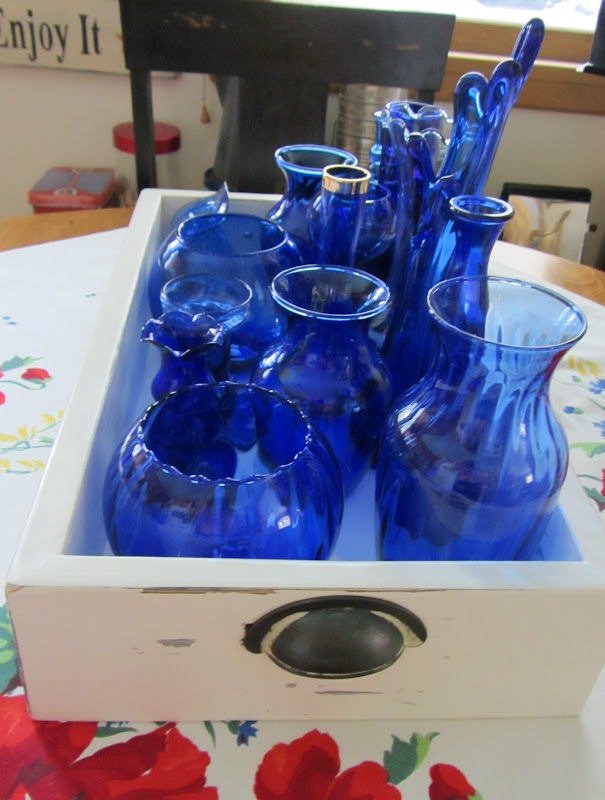 These vases aren't especially expensive or rare but displayed all together, the cobalt blue color is quite beautiful! I hope you enjoyed my little vase collection! Thank you so much for visiting me and leaving such a sweet note, its a pleasure meeting you! I really have enjoyed reading your posts you have a wonderful blog! I love the colbalt blue too the color is so pretty! Your home is lovely and so warm and inviteing. I have become your newest follower and look forward to visiting you again. 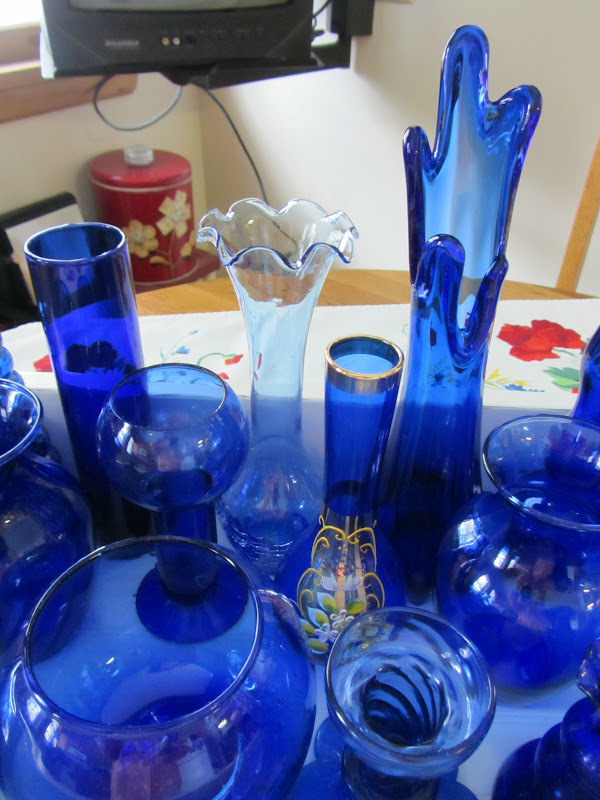 I love your Colbalt Blue so Beautiful and the way you have put them all together on your table. Thanks so much for your sweet comments on my new Tablescape. I hope you will come over and follow my Linky and I will follow you back. I also hope you have a wonderful week with you family. 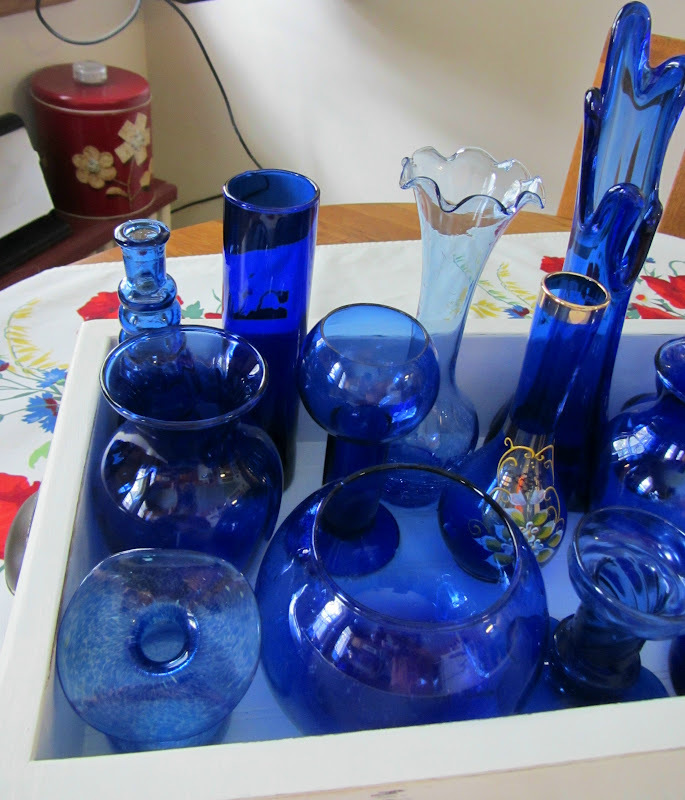 Your cobalt collection makes quite a lovely statement grouped together. Thanks for stopping by. What beautiful colors. I love the lunch cloth, and the cobalt blue. 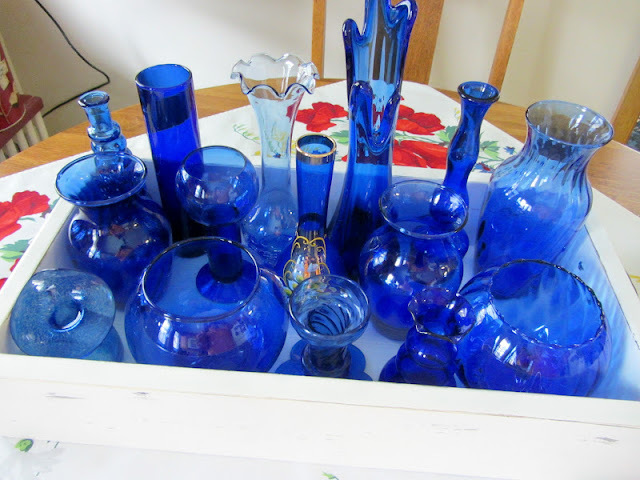 I to love cobalt blue anything...lol I have a small collection of bottles that I keep on my kitchen window sill and in the afternoon when the sun shines in they are so beautiful! Love you box too! May have to copy that one! Loving the blue all bound together in one box. Like a family. A really gorgeous family. 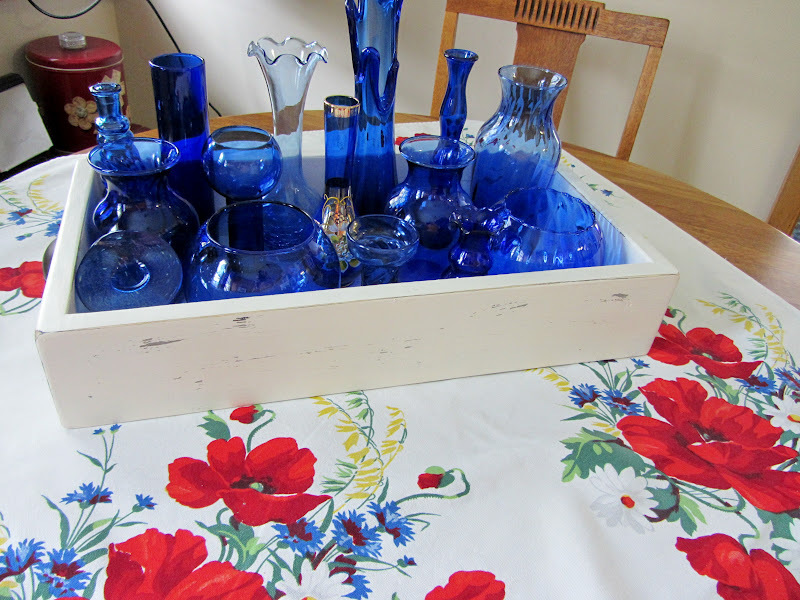 Your cobalt glass shines on that gorgeous tablecloth! Love your collection. I, too, have a weakness for coblat blue. the yellow flowers might be forsythia - they grow on a stalk like that. Nice blog! Oh my gosh! They look beautiful together! Wow! Who knew!? Thanks for linking up! Cobalt blue is a favorite color of mine. What a fun collection. Where did you find them all? I really love all the blue you have!! I have a very few pieces and a wine bottle that has a band around the top that says "Relax" They are in my kitchen window! Thanks for sharing! That color really pops! I love them all grouped together like that. 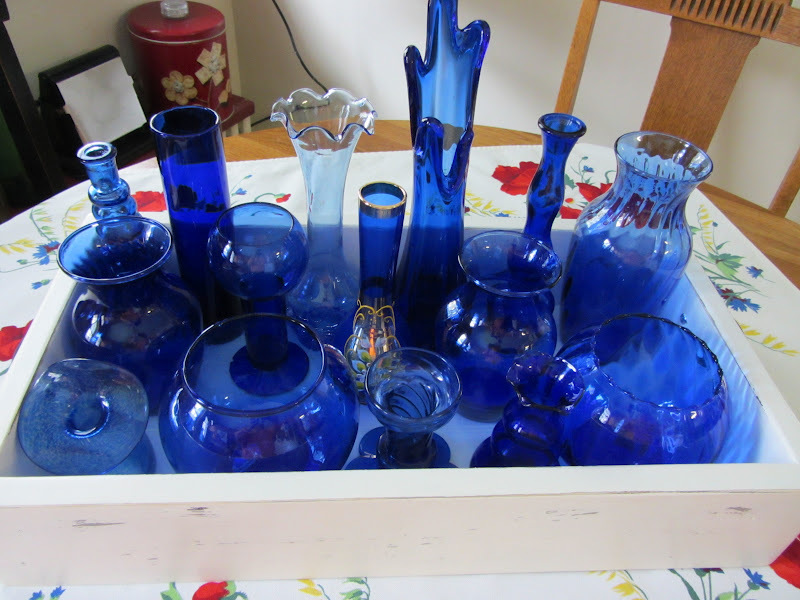 I used to collect my mom's old Noxema glass jars because I loved that cobalt blue so much. Sure wish I would have kept them now! Have a wonderful weekend. Great post! Gorgeous. What a great idea. I have tons of ruby glass. I will have to borrow your idea. I am also in love with cobalt blue glass. You should check out my blog header, you'd be in heaven! I love the way you grouped them in that drawer and with that vintage cloth, just gorgeous! Love your cobalts! I too love them and have several like yours. I don't worry about the monetary value, I just LOVE the color.